You can create and apply tags to help organize the materials in your Dossier account. You can create a tag and apply it to multiple files, or apply tags to files one at a time. You can also filter the list of materials using tags. 1. Click the addition symbol under the file title and click "Add New Tag"
2. Enter the new tag and click "Save"
You can choose to apply an existing tag to the selected files, or create a new one. 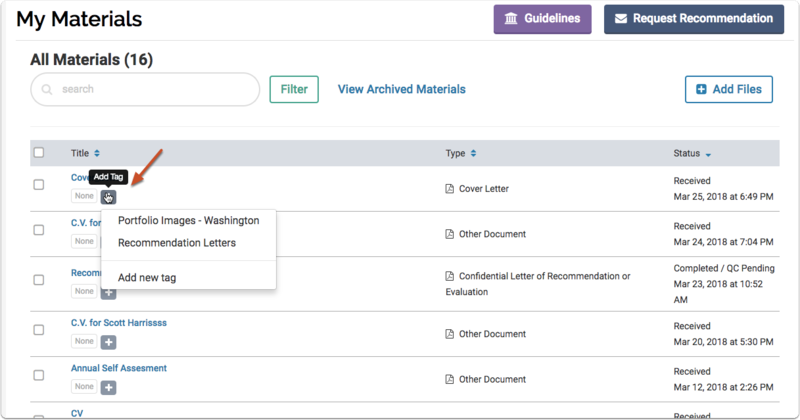 See our other guide for info on how to filter your materials within your Dossier.